Construction has been going on for months in Milan’s Galleria Vittorio Emanuele II in the center of the city, and the sign posted outside says it all: “Ristorante Cracco—opening in 2017.” The most anticipated restaurant opening of the year—Carlo Cracco’s new space—is drawing near. After a long-term adventure in Via Victor Hugo, Cracco is preparing to leave that space behind to move to Milan’s “parlor” (the nickname of the Galleria Vittorio Emanuele II). He is going to do so in grand style in a former Mercedes location, with a five-floor restaurant boasting more than 1,100 square meters of space. The chef from near Vicenza, Italy, (though he has made Milan his home) took over the space in July 2015 for 1.1 million euros per year with an 18-year contract. Because this is such a large investment, Cracco is now trying to sell his current restaurant, which he took over from the Stoppani (Peck) family in 2007, and which is valued at around 640,000 euros. Sources close to the chef have told foodcommunity.it that he is in talks with various interested buyers, not all of whom are part of the food world. It is said that the new restaurant will open in the fall or at least before the end of the year. The former MasterChef judge left the program, which is broadcast on Sky in Italy, to dedicate himself to this new “kingdom” to be located in Milan’s Galleria. The five-floor space is to include a café/bistro open seven days a week from breakfast until after dinner, a fine-dining restaurant, a multifunctional space meant to hold cultural events (exhibitions and concerts), a cantina/wine bar (that will also sell wine directly) and kitchens. This temple of food will be a further boon to the area around Milan’s Galleria, which is now home to restaurants from the Alessandro Rosso Group, Spazio by Niko Romito, Trussardi alla Scala and the famous restaurant from Cracco’s mentor, Gualtiero Marchesi. The new restaurant will also be a boost to the chef’s empire from an economic point of view. This empire includes Cracco Investimenti (a consulting business worth 1,229,674 euros), the Carlo e Camilla restaurant (2,301,038 euros) and Hugo 4 Srl (3,963,911 euros) for overall revenue of 7.5 million euros. But Cracco seems to have no intention of slowing down. At the end of 2016, he opened his first restaurant abroad. It is called Ovo, and is located in Moscow’s five-star Lotte hotel. Here he plays a consultant role. 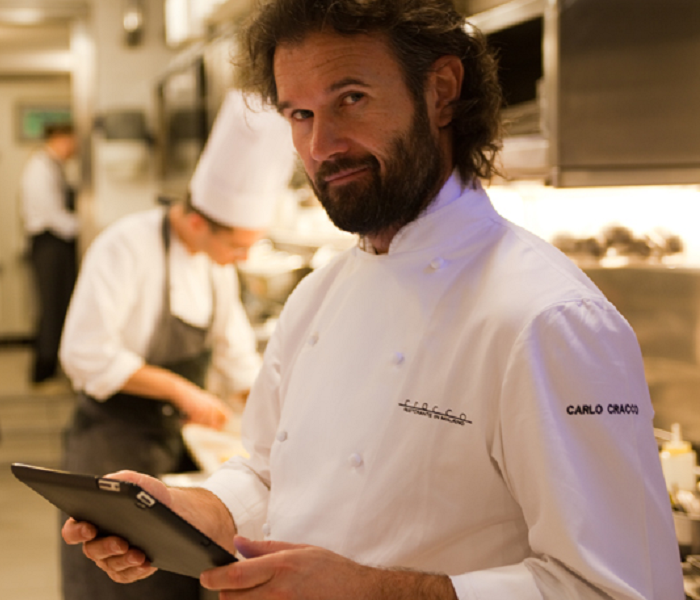 The executive chef is Emanuele Pollini who previously worked at Carlo e Camilla in Segheria. In the fall, he plans to open Garage Italia Customs in Milan. This space acquired by Lapo Elkann in Piazzale Accursio to customize cars, motorcycles, helicopters and boats will feature food by Cracco (who is a big fan of all things motorized). The fact that Cracco has bid adieu to MasterChef shows that he wants to focus on one of his big dreams: being the chef in a large restaurant in the heart of Milan, allowing his star to truly shine. Actually, make that two stars.